Hastings was born at Moira, County Down, the son of John Rawdon, 1st Earl of Moira and Elizabeth Hastings, 13th Baroness Hastings. He grew up there and in Dublin, Ireland. He joined the British Army on 7 August 1771 as an ensign in the 15th Foot. (The going rate for purchasing a commission for this rank was ₤200.) He was at Harrow School and matriculated at University College, Oxford, but dropped out. He became friends there with Banastre Tarleton. With his uncle Lord Huntington, he went on the Grand Tour. On 20 October 1773, he was promoted to lieutenant in the 5th Foot. He returned to England to join his regiment, and sailed for America on 7 May 1774. Rawdon was posted at Boston as a lieutenant in the 5th Regiment of Foot's Grenadier company, which was then under the command of Captain Francis Marsden. He first saw action at the Battles of Lexington and Concord and the Battle of Bunker Hill. Serving with the grenadiers, he participated in the second assault against Breed's Hill (which failed), and the third assault against the redoubt. As his superior, a Captain George Harris, was wounded beside him, he took command of his company, for the successful assault. John Burgoyne noted in dispatches: "Lord Rawdon has this day stamped his fame for life." He also was wounded during the assault. He was promoted captain, and given a company in the 63rd Foot. After having recognized him, it is said that it was Lieutenant Lord Rawdon killed the American general Joseph Warren. 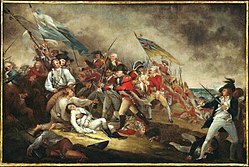 Lord Rawdon is depicted in John Trumbull's famous painting, The Death of General Warren at the Battle of Bunker Hill. Rawdon is in the far background holding the British ensign. During the Boston winter quarters, Rawdon made his stage debut, delivering a prologue for Aaron Hill's tragedy, Zara, which had been written by John Burgoyne. He was appointed Aide-de-camp to General Sir Henry Clinton, and sailed with him on the expedition to Brunswick Town, North Carolina, on the Cape Fear River, and then to the repulse at Fort Moultrie, Charleston, South Carolina. He returned with him to New York. On 4 August, he dined with General Clinton, Admiral Lord Howe, Lord Cornwallis, General Vaughan, and others. During the Battle of Long Island, he was at headquarters with Clinton. On 15 September, Rawdon led his men at Kip's Bay, an amphibious landing on Manhattan island. The next day, he led his troops in support of the Light Infantry that attacked Harlem Heights until the Americans withdrew. He participated at the landings at Pell's Point. The British pressed the Americans to White Plains, where on 1 November the Americans withdrew from their entrenchments. On 8 December Rawdon landed with Clinton at Rhode Island, securing the ports for the British Navy. On 13 January 1777, with Clinton, he departed for London, arriving 1 March. During a ball at Lord George Germain's, he met Lafayette, who was visiting London. Returning to America in July, while Howe went to his Philadelphia campaign, Rawdon went with Clinton to the New York headquarters. He participated in the battles of the New York Highlands, where on 7 October, Fort Constitution (opposite West Point) was captured. However, this was too late to link up with General Burgoyne at Albany. Rawdon was sent to Philadelphia with dispatches and returned to New York for the winter, where he raised a regiment, called the Volunteers of Ireland, recruited from deserters and Irish Loyalists. Promoted colonel in command of this regiment, Rawdon went with Clinton to Philadelphia. starting out on 18 June 1778, he went with Clinton during the withdrawal from Philadelphia to New York, and saw action at the Battle of Monmouth. He was appointed adjutant general. Rawdon was sent to learn news of the Battle of Rhode Island. At New York, on 3 September 1779, he quarreled with Clinton, and resigned his position as adjutant general. He served with the Volunteers of Ireland during the raid on Staten Island by Lord Stirling on 15 January 1780. He went south to the Siege of Charleston with reinforcements. After the city fell to the British, Lord Cornwallis posted him at Camden (16 August 1780) as the British sought to occupy South Carolina. Rawdon commanded the British left wing at the Battle of Camden. When Cornwallis went into Virginia, he left Rawdon in effective command in the South. Perhaps his most noted achievement was the victory in 1781 at the Battle of Hobkirk's Hill, in which, in command of only a small force, he defeated by superior military skill and determination, a much larger body of Americans. Thinking (in error) that General Nathanael Greene had moved his artillery away, Rawdon attacked Greene's left wing, forcing the Americans to retire. However, Rawdon was forced to begin a gradual retreat to Charleston. He relieved the Siege of Ninety-Six, evacuating its small garrison and conducting a limited pursuit of American troops. He withdrew his forces to Charleston. In July 1781, in poor health, he gave up his command. On his return to Great Britain, he was captured at sea by François Joseph Paul de Grasse, but was exchanged. After Rawdon's departure, the British evacuated Charleston as the war drew to a close. They took thousands of Loyalists and freed slaves with them, having promised freedom to slaves of rebels who joined their lines, resettling these groups in Nova Scotia and the Caribbean. Rawdon became active in associations in London. He was elected a Fellow of the Royal Society in 1787 and Fellow of the Society of Antiquaries of London in 1793. For 1806-8 he was Grand Master of the Free Masons. In May 1789 he acted as the Duke of York's second in his duel with Lieut.-Colonel Lennox on Wimbledon Common. Following the declaration of war in 1793 of France upon Great Britain, Rawdon-Hastings (as he was now known) was appointed major general, on 12 October 1793. Sent by the Pitt ministry, Rawdon-Hastings launched an expedition into Ostend, France, in 1794. He marched to join with the army of the Duke of York, at Alost. The French general Pichegru, with superior numbers, forced the British back toward their base at Antwerp. Rawdon-Hastings left the expedition, feeling Pitt had broken promises. Rawdon sat for Randalstown in the Irish House of Commons from 1781 until 1783. That year he was created Baron Rawdon, of Rawdon, in the County of York. In 1787, he became friends with the Prince of Wales, and loaned him many thousands of pounds. In 1788 he became embroiled in the Regency Crisis. In 1789, he took the surname Hastings in accordance with his uncle's will. He succeeded his father as 2nd Earl of Moira on 20 June 1793, and thereafter served in the House of Lords for three decades. Inheriting Donington Hall in Leicestershire from his uncle, Rawdon rebuilt it in 1790–93 in the Gothic style; the architect was William Wilkins the Elder. It is now a Grade II* listed building. He placed the estate at the disposal of the Bourbon Princes upon their exile in England following the French Revolution. He is said to have left a signed cheque-book in each bedroom for the occupant to use at pleasure. In 1797 it was rumoured briefly that Rawdon (Moira) would replace Pitt as Prime Minister. There was some discontent with Pitt over his policies regarding the war with France. Additionally Pitt's long tenure in office had given him ample opportunity to annoy various political grandees, including but not limited to The Duke of Leeds and Lords Thurlow and Lansdowne. In mid-May a combination of these various figures, coupled with a handful of Members of Parliament, proposed to make Rawdon (Moira) the Prime Minister. Having fought in the American War and having led an expedition to Quiberon, he commanded widespread respect. His relationship to the Prince of Wales also established him as a potential rival to Pitt, who was supported strongly by King George III. The prime motivation for the plan of having Rawdon (Moira) become Prime Minister was to secure peace with France, the plotters having come to believe (somewhat unfairly) that Pitt was an obstacle to this objective. But their plan collapsed barely a month later in mid-June because of a lack of support from the political establishment. Additionally when Rawdon (Moira) wrote to the King to propose the change of chief ministers, the monarch ignored him. Thus the proposal came to nothing. He became Commander-in-Chief, Scotland with the rank of full general in September 1803. Rawdon was a long-standing advocate of Irish issues, in particular Catholic Emancipation. At one point he was described by the Irish revolutionary Wolfe Tone as "The Irish Lafayette". Becoming a Whig in politics, he entered government in 1806 as part of the Ministry of All the Talents as Master-General of the Ordnance, but resigned upon the fall of the ministry the next year. He was also Constable of the Tower (of London) from 1806 to his death. Being a close associate of the Prince-Regent, Moira was asked by him to form a Whig government after the assassination of Spencer Perceval in 1812 ended that ministry. Both of Moira's attempts to create a governing coalition failed. The Tories returned to power under the Earl of Liverpool. On 6 December 1816, Moira was raised to the rank of Marquess of Hastings together with the subsidiary titles Viscount Loudoun and Earl of Rawdon. He also became the patron of Thomas Moore, the Irish poet. Moore visited his patron's new seat, Donington Hall, and wrote about his impressions of it. "I thought it all exceedingly fine and grand, but most uncomfortable." Moore was later disappointed when Moira, having been appointed Governor General of India, did not offer to take him to India on his staff. The two men met but once again. Through the influence of the Prince-Regent, Moira was appointed Governor-General of India on 11 November 1812. His tenure as Governor-General was a memorable one, overseeing the victory in the Gurkha War (1814–1816); the final conquest of the Marathas in 1818; and the purchase of the island of Singapore in 1819. After delays clearing affairs, he reached Madras on 11 September 1813. In October, he settled in at Calcutta. British India then consisted of Madras, Bengal, and Bombay. He commanded an army of 15,000 British regulars, a Bengal army of 27 regiments of native infantry, and eight regiments of cavalry; a Madras army, led by General John Abercrombie of 24 regiments of native infantry, and eight regiments of native cavalry. In May 1813, the British declared war against the Gurkhas of Nepal. Hastings sent four divisions in separate attacks led by General Bennet Marley with 8,000 men against Kathmandu, General John Sullivan Wood with 4,000 men against Butwal, General Sir David Ochterlony with 10,000 men against Amar Singh Thapa, and General Robert Rollo Gillespie, with 3,500 men against Nahan, Srinagar, and Garhwal. Only Ochterlony had some success; Gillespie was killed. After inconclusive negotiations, Hastings reinforced Ochterlony to 20,000 men, who then won the battle of Makwanpur on 28 February. The Gurkhas then sued for peace, under the Sugauli Treaty. After raids by Pindaris in January 1817, Hastings led a force at Hindustan in the North; in the South, the Army of the Deccan, under the command of General Sir Thomas Hislop. The Peshwa was defeated by William Fullarton Elphinstone on the Poona. Appa Sahib was defeated at the battle of Nagpur. Hislop defeated Holkar at the Battle of Mahidpur. Rawdon was active diplomatically, protecting weaker Indian states. His domestic policy in India was also largely successful, seeing the repair of the Mughul canal system in Delhi in 1820, as well as educational and administrative reforms. He confirmed the purchase of Singapore from the Sultan of Jahore, by Sir Stamford Raffles, in January 1819. He became increasingly estranged from the East India Company's Board of Control (see Company rule in India). He was appointed Governor of Malta in 1824 but died at sea off Naples two years later aboard HMS Revenge, attempting to return home with his wife. She returned his body to Malta, and following his earlier directions, cut off his right hand and preserved it, to be buried with her when she died. His body was then laid to rest in a large marble sarcophagus in Hastings Gardens, Valletta. His hand was eventually interred, clasped with hers, in the family vault at Loudoun Kirk. He was awarded the freedom of the city of Dublin in recognition of his service in America. Loyalists whom he rescued from the Siege of Ninety Six during the American Revolution were resettled by the Crown and granted land in Nova Scotia. They named their township Rawdon in his honor. Hastings County, Ontario, and three of its early townships were named after him, by Loyalists who were resettled in Upper Canada after the American Revolution. HMS Moira was named in his honour in 1805, as was the Moira River in Ontario, Canada. Flora Elizabeth Rawdon-Hastings (11 February 1806 – 5 July 1839), died unmarried. Hon. Francis George Augustus (1807–1807), died in infancy. Sophia Frederica Christina Rawdon-Hastings (1 February 1809 – 28 December 1859), married John Crichton-Stuart, 2nd Marquess of Bute and had children. Selina Constance Rawdon-Hastings (1810 – 8 November 1867), married Charles Henry and had children. Adelaide Augusta Lavinia Rawdon-Hastings (25 February 1812 – 6 December 1860), married Sir William Murray, 7th Baronet of Octertyre. The character of Rawdon Crawley in William Makepeace Thackeray's novel Vanity Fair is named after him. He is also Francis Rawdon Hastings, the Second Earl of Moira, in Stephanie Barron's novel "Jane and the Barque of Frailty." ^ Nelson, Paul David (2005). Francis Rawdon-Hastings, Marquess of Hastings: Soldier, Peer of the Realm, Governor-General of India. Fairleigh Dickinson Univ Press. ISBN 9780838640715. ^ Paul David Nelson (7 May 2007). "Lord Rawdon, Baron Rawdon, Earl of Moira, Marquess of Hastings". www.banastretarleton.org. Archived from the original on 29 January 2009. Retrieved 26 October 2008. ^ "Fellows Details". Royal Society. Retrieved 23 January 2018. ^ Brown, J. (1851) A History of the Highlands and of the Highland Clans, Vol.IV. ^ James, C. (1805) A New and Enlarged Military Dictionary, 2nd ed. ^ "No. 12419". The London Gazette. 1 March 1783. p. 1. ^ "Francis Rawdon-Hastings, 1st Marquess of Hastings". Oxford Dictionary of National Biography. Retrieved 29 November 2014. ^ "No. 17198". The London Gazette. 7 December 1816. p. 2314. ^ "Francis Rawdon- Hastings, 1st Marquess of Hastings | eHISTORY". ehistory.osu.edu. Retrieved 15 November 2017. ^ Boyce, Gerald E. (1967). Historic Hastings, Belleville: Hastings County Council. This article incorporates text from a publication now in the public domain: Chisholm, Hugh, ed. (1911). "Hastings, Francis Rawdon-Hastings, 1st Marquess of" . Encyclopædia Britannica. 13 (11th ed.). Cambridge University Press. pp. 53–55. Paul David Nelson (2005). Francis Rawdon-Hastings, Marquess of Hastings: Soldier, Peer of the Realm, Governor-General of India. Fairleigh Dickinson University Press. ISBN 978-0-8386-4071-5. Beevor, R. J. (1931). Hastings of Hastings. Printed for Private Circulation. Kelly, Ronan (2009). Bard of Erin: The Life of Thomas Moore. Penguin Books. Morley, Vincent (2002). Irish opinion and the American Revolution, 1760–83. Cambridge University Press. This page was last edited on 24 March 2019, at 04:06 (UTC).